Granted, there are no perfect camera settings for every landscape you encounter. However, there are some good starting points to use when you find a landscape that benefits from motion blur or one that highlights a nice sunrise or sunset. This step-by-step guide takes you through each of these scenarios and explains the camera settings that are most likely to get you the photographic results you want. Motion blur is all about the shutter speed you use - the slower the shutter, the more pronounced the blur will be. The most difficult task when using a slow shutter is ensuring that your image is well exposed. 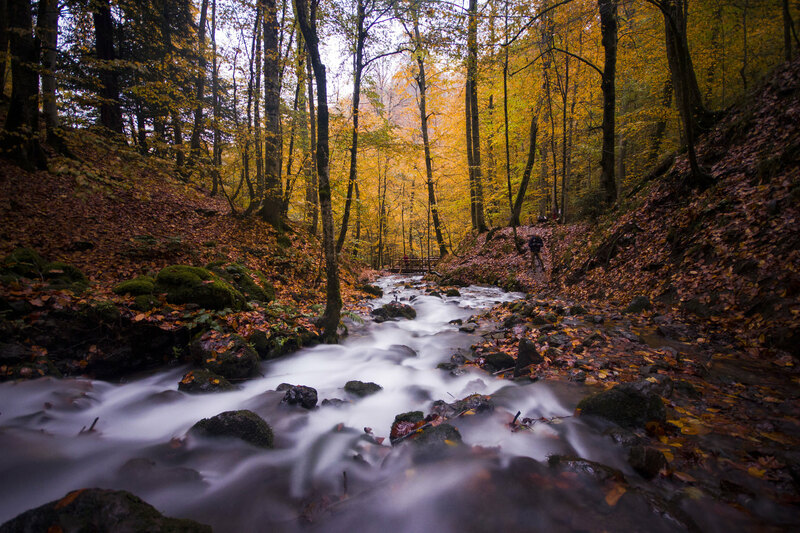 As the length of the shutter speed is extended, more and more light is allowed to reach your camera’s sensor. That means you have to make adjustments to the other two exposure settings - aperture and ISO - to compensate. If you don’t, your images will be vastly overexposed, reduced to little more than a bright, white nothingness. So, as your shutter speed is lengthened, you will need to reduce the size of your aperture to restrict the amount of light entering the lens. Recall that smaller apertures are indicated by larger f-numbers. For example, f/22 is a smaller aperture opening than f/2.8, therefore, f/22 would be more appropriate for counteracting the light allowed into your camera by a very slow shutter. Furthermore, remember that ISO controls the sensitivity of your camera’s sensor to light. The lower the ISO number, the less sensitive it is. Since you will have plenty of light entering your camera as a result of the slow shutter speed, you’ll need to minimize the ISO. Shooting mode: Full manual. This will give you the most control over the necessary settings to get the kind of motion blur you want. Drive mode: Single shot if using a remote. If you don’t have a remote, use your camera’s self-timer so you don’t disturb the camera by touching it during the exposure. Shutter Speed: 1/4 seconds. The speed of your shutter will depend on the speed of the movement you want to blur, but this is a good place to start. If you don’t get the level of blur you want, slow the shutter one stop at a time until you achieve the look you want. Aperture: f/22. As noted above, a small aperture is needed to restrict the amount of light entering the lens to counteract the abundance of light allowed in due to the slow shutter. ISO: 100 (or the lowest available setting). Minimizing your ISO will also help counteract the light allowed in by the slow shutter. Note that if your images are consistently overexposed even when minimizing the size of your aperture and using the smallest ISO possible, you might need to utilize a neutral density filter to further restrict the light coming into your lens. 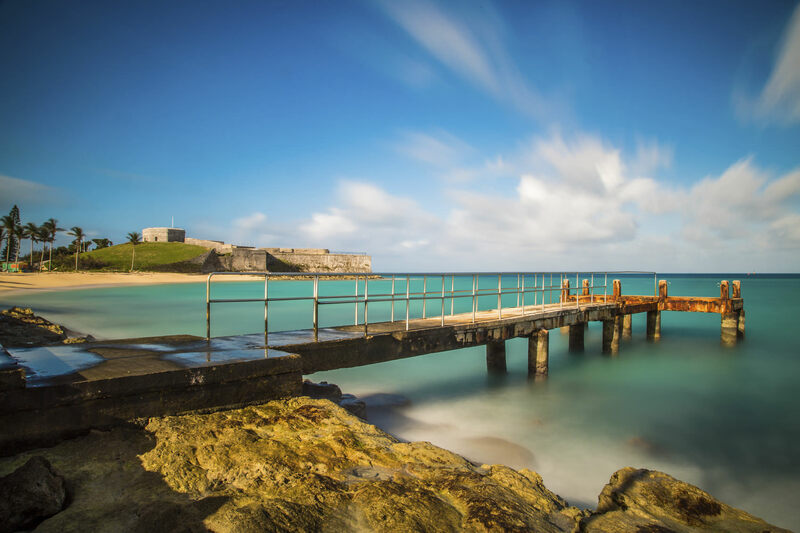 Neutral density filters come in a variety of strengths, some of which are so strong that they allow you to take long exposure images even during broad daylight. 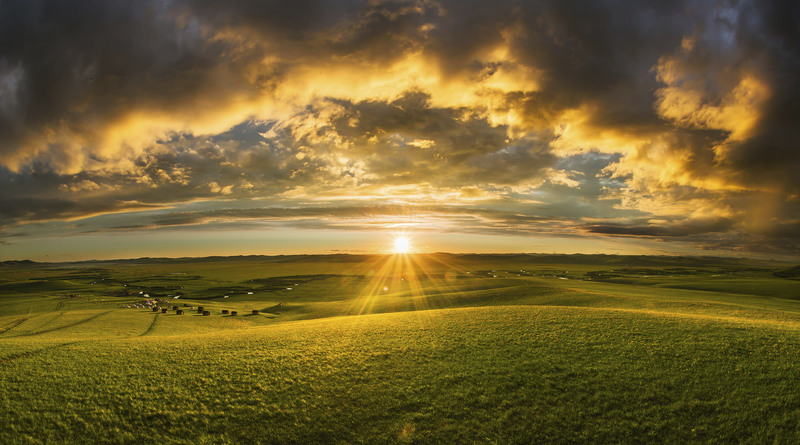 Sunrises and sunsets are a bit of a holy grail for landscape photographers, and with good reason: the gorgeous light and the abundance of colors in the sky makes for the possibility of capturing a truly stunning image. 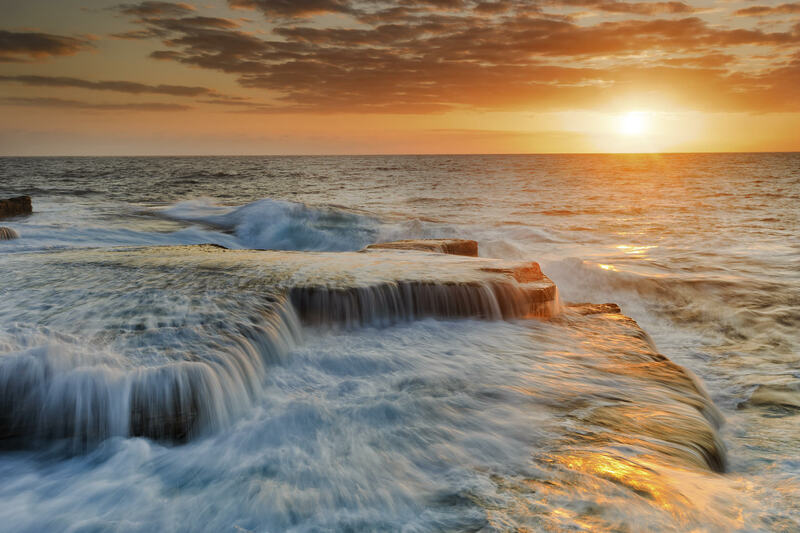 The greatest challenge of photographing a sunrise or sunset is getting the exposure right throughout the scene. Often, you’ll end up with a sky that’s well-exposed and a foreground that’s too dark, or a foreground that is well-exposed and a sky that’s far too bright. There’s just too much contrast for your camera to keep up with. There are a couple of ways of getting around this. Perhaps most simply is to use a graduated neutral density filter that darkens the sky to bring it more in line with the exposure level of the foreground. Another option is to take two images that are exact matches in terms of composition, but one that is exposed for the sky and another that’s exposed for the foreground. 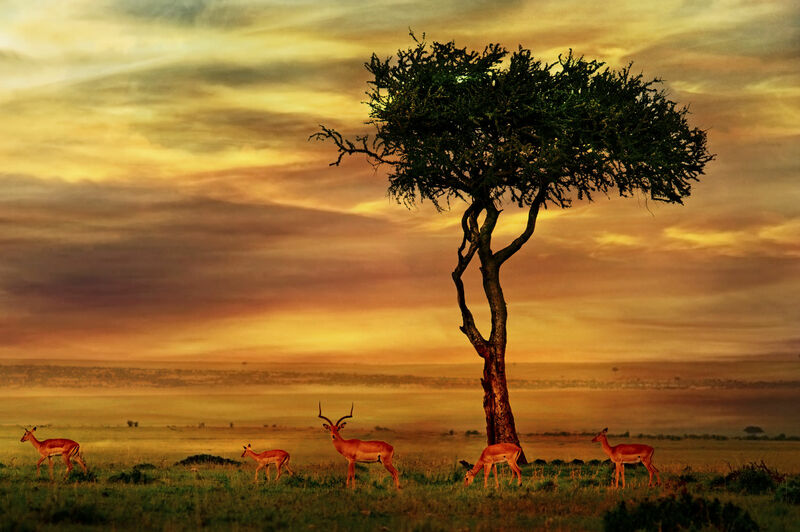 Then you can blend the exposures together in post-processing to create one well-exposed image. Shutter Speed: 1/30 seconds. This is a ballpark figure based on the slowest possible speed most people can hold a camera steady in their hand. If you find that your images are blurry at this speed, select a faster shutter speed. Aperture: f/11. At this aperture, you have good depth of field, but also restrict the light from the sunrise or sunset somewhat. Note that if you have to speed up your shutter, which limits the light coming in, you’ll need to open your aperture to allow more light in to retain a well-exposed image. For example, if you change your shutter speed from 1/30 seconds to 1/45 seconds, change your aperture from f/11 to f/8 to compensate. ISO: 100 (or the lowest available setting). White balance: Shade. Though it seems counterintuitive, using the shade white balance preset will boost the warm tones of the sunset, giving the sky even greater impact. Remember that the settings recommended above are just a starting point - the chances are that you will need to make adjustments based on the specific situation in which you shoot. Nonetheless, learning how to manipulate things like aperture, ISO, and shutter speed will help you understand exposure and tailor your settings to the type of landscape you wish to photograph. Take these recommendations and run with them, and see what sort of gorgeous landscape photos you can create. 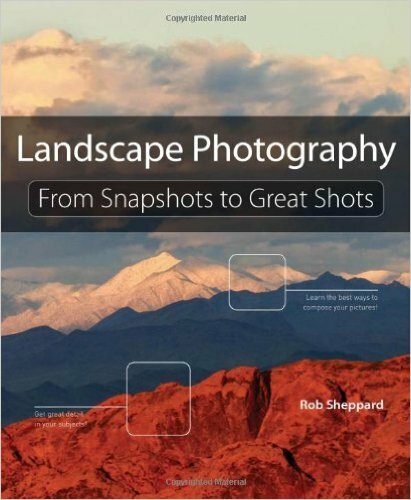 Landscape Photography: From Snapshots to Great Shots by Rob Sheppard will help you build on the skills you learned in this lesson regarding camera settings and take your learning even further into the realms of light, composition, perspective, depth of field, and beyond. 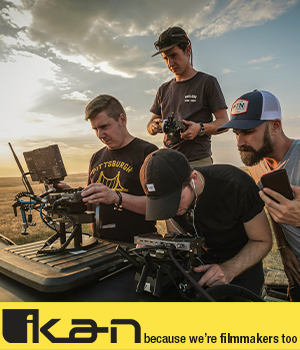 Sheppard makes strong connections between what you do behind the lens and what’s happening in front of it, helping you to maximize the impact of your image by understanding how you camera, lens, and other photography gear works. With stunning example images to supplement the easy-to-read text, Landscape Photography: From Snapshots to Great Shots will help you take truly stunning landscape photos. PhotographyTalk readers have been asking for a list of top-notch photography companies, and we’ve obliged! Our Recommended Vendor section is chock full of the best photography companies out there. Take your landscape photography to a whole new level by equipping yourself with the best gear, finding workshops to attend in your area, and learning about handy accessories to help your workflow.